When I first wrote this blog, the event was more than three years away. Not anymore! Each day now seems to bring a new announcement of a talk, a workshop, or an event related to the eclipse. With tens of millions of people headed for the zone of totality, it’s going to be the biggest science event in history. In this blog I list 25 of the eclipse's important details for our readership, the general public, and the media. Read them, and learn about the event. But for sure plan to experience totality. You'll remember it for the rest of your life as the greatest thing you ever saw! 1. This will be the first total solar eclipse in the continental U.S. in 38 years. The last one occurred February 26, 1979. Unfortunately, not many people saw it because it clipped just five states in the Northwest and the weather for the most part was bleak. Before that one, you have to go back to March 7, 1970. 2. A solar eclipse is a lineup of the Sun, the Moon, and Earth. The Moon, directly between the Sun and Earth, casts a shadow on our planet. If you’re in the dark part of that shadow (the umbra), you’ll see a total eclipse. If you’re in the light part (the penumbra), you’ll see a partial eclipse. 3. A solar eclipse happens at New Moon. The Moon has to be between the Sun and Earth for a solar eclipse to occur. The only lunar phase when that happens is New Moon. 4. Solar eclipses don’t happen at every New Moon. The reason is that the Moon’s orbit tilts 5° to Earth’s orbit around the Sun. Astronomers call the two intersections of these paths nodes. Eclipses only occur when the Sun lies at one node and the Moon is at its New (for solar eclipses) or Full (for lunar eclipses) phase. During most (lunar) months, the Sun lies either above or below one of the nodes, and no eclipse happens. 5. Eclipse totalities are different lengths. The reason the total phases of solar eclipses vary in time is because Earth is not always at the same distance from the Sun and the Moon is not always the same distance from Earth. The Earth-Sun distance varies by 3 percent and the Moon-Earth distance by 12 percent. The result is that the Moon’s apparent diameter can range from 7 percent larger to 10 percent smaller than the Sun. 6. It's all about magnitude and obscuration. Astronomers categorize each solar eclipse in terms of its magnitude and obscuration, and I don’t want you to be confused when you encounter these terms. The magnitude of a solar eclipse is the percent of the Sun’s diameter that the Moon covers during maximum eclipse. The obscuration is the percent of the Sun’s total surface area covered at maximum. Here's an example: If the Moon covers half the Sun's diameter (in this case the magnitude equals 50 percent), the amount of obscuration (the area of the Sun's disk the Moon blots out) will be 39.1 percent. 7. 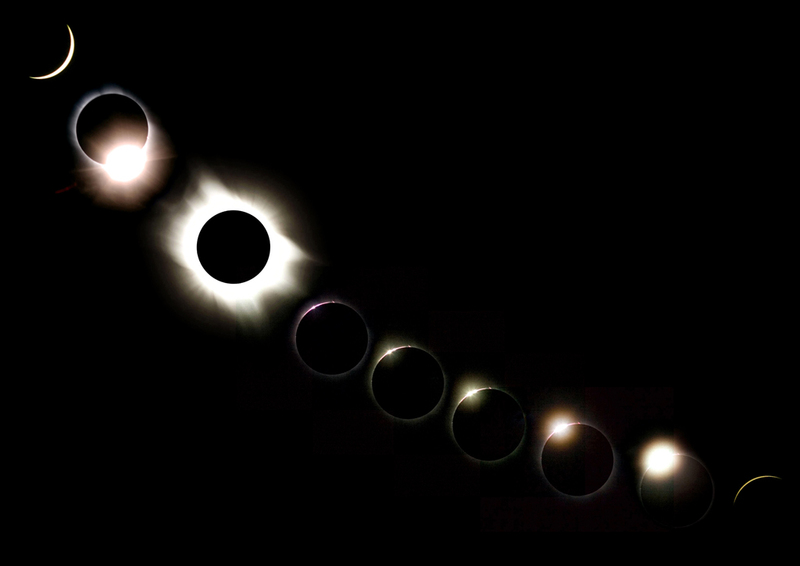 Solar eclipses occur between Saros cycles. Similar solar and lunar eclipses recur every 6,585.3 days (18 years, 11 days, 8 hours). Scientists call this length of time a Saros cycle. Two eclipses separated by one Saros cycle are similar. They occur at the same node, the Moon’s distance from Earth is nearly the same, and they happen at the same time of year. 8. Everyone in the continental U.S. will see at least a partial eclipse. In fact, if you have clear skies on eclipse day, the Moon will cover at least 48 percent of the Sun’s surface. And that’s from the northern tip of Maine. 9. It’s all about totality. Not to cast a shadow on things, but likening a partial eclipse to a total eclipse is like comparing almost dying to dying. I know that 48 percent sounds like a lot. It isn’t. You won’t even notice your surroundings getting dark. And it doesn’t matter whether the partial eclipse above your location is 48, 58, or 98 percent. Only totality reveals the true celestial spectacle: the diamond ring, the Sun’s glorious corona, strange colors in our sky, and seeing stars in the daytime. 10. You want to be on the center line. This probably isn’t a revelation, but the Moon’s shadow is round. If it were square, it wouldn’t matter where you viewed totality. People across its width would experience the same duration of darkness. The shadow is round, however, so the longest eclipse occurs at its center line because that’s where you’ll experience the Moon’s shadow’s full width. 11. First contact is in Oregon. If you want to be the first person to experience totality in the continental U.S., be on the waterfront at Government Point, Oregon, at 10:15:56.5 a.m. PDT. There, the total phase lasts 1 minute, 58.5 seconds. 12. The center line crosses through 12 states. After a great west-to-east path across Oregon, the center line takes roughly nine minutes to cross a wide swath of Idaho, entering the western part of the state just before 11:25 a.m. MDT and leaving just before 11:37 a.m. MDT. Next up is Wyoming, where the umbral center line dwells until just past 11:49 a.m. MDT. From 11:47 a.m. MDT until 1:07 CDT (note the time zone change! ), the dark part of the Moon's shadow lies in Nebraska. The center line hits the very northeastern part of Kansas at 1:04 p.m. CDT and enters Missouri a scant two minutes later. At 1:19, the shadow’s midpoint crosses the Mississippi River, which at that location is the state border with Illinois. The center line leaves Illinois at its Ohio River border with Kentucky just past 1:24 p.m. CDT. Totality for that state starts there two minutes earlier and lasts until nearly 1:29 p.m. CDT. The center line crosses the border into Tennessee around 1:26 p.m. CDT. Then, just past the midpoint of that state, the time zone changes to Eastern. North Carolina has the midpoint of the eclipse from 2:34 p.m. EDT until just past 2:38 p.m. EDT. The very northeastern tip of Georgia encounters the center line from just past 2:35 p.m. EDT until not quite 2:39 p.m. EDT. Finally, it’s South Carolina’s turn. The last of the states the center line crosses sees its duration from 2:36 p.m. EDT to 2:39 p.m. EDT. 13. Totality lasts a maximum of 2 minutes and 40.2 seconds. That’s it. To experience that length, you’ll need to be slightly south of Carbondale, Illinois, in Giant City State Park. You might think about getting there early. 14. The end of the eclipse for the U.S. is not on land. The center line’s last contact with the U.S. occurs at the Atlantic Ocean’s edge just southeast of Key Bay, South Carolina. I’m pretty sure the crowd won’t be huge there. 15. Cool things are afoot before and after totality. Although the big payoff is the exact lineup of the Sun, the Moon, and your location, keep your eyes open during the partial phases that lead up to and follow it. As you view the beginning through a safe solar filter, the universe will set your mind at ease when you see the Moon take the first notch out of the Sun’s disk. Around the three-quarters mark, you’ll start to notice that shadows are getting sharper. The reason is that the Sun’s disk is shrinking, literally approaching a point, and a smaller light source produces better-defined shadows. At about 85 percent coverage, someone you’re with will see Venus 34° west-northwest of the Sun. If any trees live at your site, you may see their leaves act like pinhole cameras as hundreds of crescent Suns appear in their shadows. 16. This eclipse will be the most-viewed ever. I base this proclamation on four factors: 1) the attention it will get from the media; 2) the superb coverage of the highway system in our country; 3) the typical weather on that date; and 4) the vast number of people who will have access to it from nearby large cities. 17. Only one large city has a great view. Congratulations if you’re one of the 609,000 people lucky enough to live in Nashville. The city center and parts north of it will experience 2+ minutes of totality. Unfortunately, that’s the only large city with a great view. In the tally below, column 1 lists 25 other large metropolitan areas. The second column shows the amount of the Sun’s surface the Moon will cover as seen by viewers in each city. Now a brief follow-up: about half of both Kansas City (pop. = 464,000) and Saint Louis (pop. = 318,000) lie within the path of totality. Unfortunately, the center line doesn’t pass through either of them. An educated guess then, tells me that most residents interested in the eclipse will drive 30 minutes or so for an extra two minutes of totality. 18. A few small cities are well-placed. Here’s a list of smaller municipalities either on the center line or near it with their approximate populations. 19. Totality is safe to look at. During the time the Moon’s disk covers that of the Sun, it’s safe to look at the eclipse. In fact, to experience the awesomeness of the event, you must look at the Sun without a filter during totality. 20. Yes, the Sun’s a lot bigger. Our daytime star’s diameter is approximately 400 times larger than that of the Moon. What a coincidence that it also lies roughly 400 times farther away. This means both disks appear to be the same size. 21. You won’t need a telescope. One of the great things about the total phase of a solar eclipse is that it looks best to naked eyes. The sight of the corona surrounding the Moon’s black disk in a darkened sky is unforgettable. That said, binoculars give you a close-up view — but still at relatively low power — that you should take advantage of several times during the event. 22. Nature will take heed. Depending on your surroundings, as totality nears you may experience strange things. Look. You’ll notice a resemblance to the onset of night, though not exactly. Areas much lighter than the sky near the Sun lie all around the horizon. Shadows look different. Listen. Usually, any breeze will dissipate and birds (many of whom will come in to roost) will stop chirping. It is quiet. Feel. A 10°–15° F drop in temperature is not unusual. 23. Maximum totality is not the longest possible in 2017. The longest possible duration of the total phase of a solar eclipse is 7 minutes and 32 seconds. Unfortunately, the next solar eclipse whose totality approaches 7 minutes won’t occur until June 13, 2132. Its 6 minutes and 55 seconds of totality will be the longest since the 7 minutes and 4 seconds of totality June 30, 1973. 24. The future is bright but long. 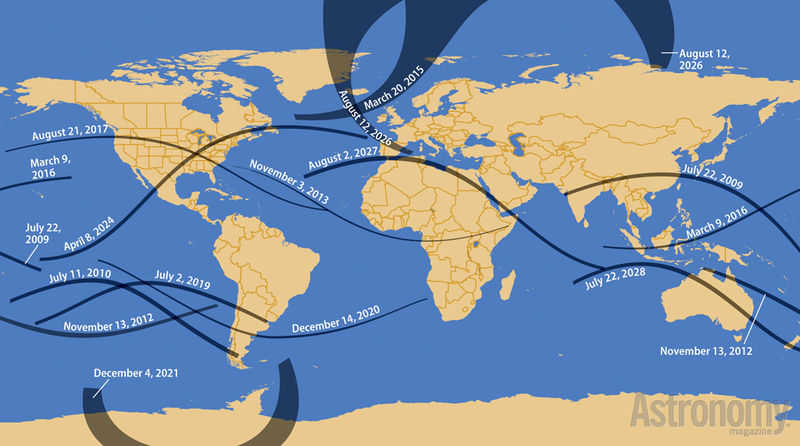 The next total solar eclipse over the continental U.S. occurs April 8, 2024. It’s a good one, too. Depending on where you are (on the center line), the duration of totality lasts at least 3 minutes and 22 seconds on the east coast of Maine and stretches to 4 minutes and 27 seconds in southwestern Texas. After that eclipse, it’s a 20-year wait until August 23, 2044 (and, similar to the 1979 event, that one is visible only in Montana and North Dakota). Total solar eclipses follow in 2045 and 2078. 25. This event will happen! As astronomers (professional or amateur), some of the problems we have are due to the uncertainty and limited visibility of some celestial events. Comets may appear bright if their compositions are just so. Meteor showers might reach storm levels if we pass through a thick part of the stream. (Oh, and the best views are after midnight.) A supernova as bright as a whole galaxy is visible now, but you need a telescope to view it. In contrast, this solar eclipse will occur when we say, where we say, for how long we say, and in the daytime, no less. Guaranteed! BONUS: Facts are great, but I also posted a list of two-dozen-plus-one tips you might find useful. Check out Two dozen tips for the August 21, 2017, total solar eclipse.